The goal of this volume is to discuss--in depth--the ways in which various "deviations" from "traditional" family styles affect childrearing practices and child development. Each of the contributors illustrates the dynamic developmental processes that characterize parenting and child development in contexts that can be deemed "nontraditional" because they do not reflect the demographic characteristics of the traditional families on which social scientists have largely focused. The contributors deal with the dynamics and possible effects of dual-career families, families with unusually involved fathers, families characterized by the occurrence of divorce, single parenthood, remarriage, poverty, adoption, reliance on nonparental childcare, ethnic membership, parents with lesbian or gay sexual orientations, as well as violent and/or neglectful parents. By doing so, the authors provide thoughtful, literate, and up-to-date accounts of a diverse array of "nontraditional" or traditionally understudied family types. All the chapters offer answers to a common question: How do these patterns of childcare affect children, their experiences, and their developmental processes? The answers to these questions are of practical importance, relevant to a growing proportion of the families and children in the United States, but also have significant implications for the understanding of developmental processes in general. As a result, the book will be of value to basic social scientists, as well as those professionals concerned with guiding and advising clients and public policy. "Michael Lamb has been at work on important issues in child and family development for a long time. In this latest edited volume he has brought together an outstanding roster of colleagues to review the research on parenting and child development in the context of families that diverge from the format and configuration 'traditional' to 20th-century American society." "Overall, the current volume leaves the reader with a sense of having learned a great deal, renewed insight into the dangers of stereotyping, respect for human adaptability, and the realization of how much more remains to be learned." 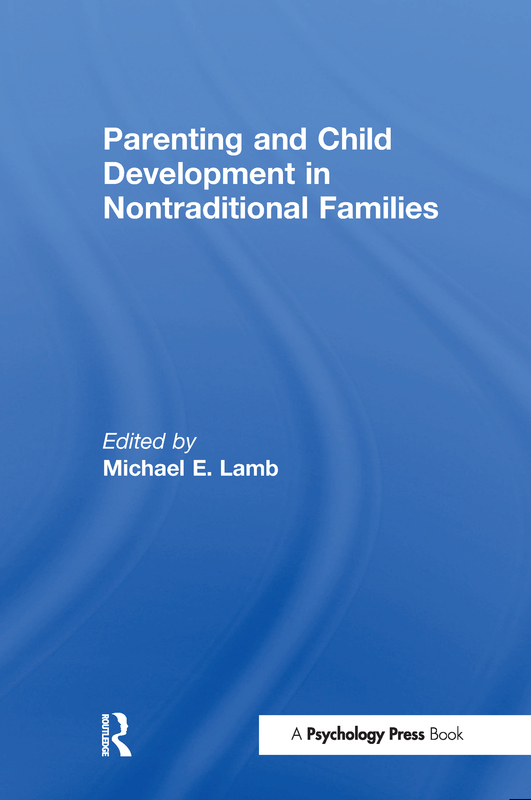 "Parenting and Child Development in 'Nontraditional' Families is the long-awaited sequal to Michael Lamb's groundbreaking book Nontraditional Families: Parenting and Child Development.….I can thoroughly recommend this book. Each of the chapters is an up-to-date and succinct review written by experts in the field….The book will be of use to students on advanced undergraduate and post-graduate courses specializing in psychosocial development. Furthermore, it should attract interest from social science courses on the family and family therapy. I would recommend the book to any social scientist wishing to broaden their knowledge of the diversity of family forms in western society in the late 20th century." Contents: Preface. M.E. Lamb, Parental Behavior, Family Processes, and Child Development in Nontraditional and Traditionally Understudied Families. A.E. Gottfried, A.W. Gottfried, K. Bathurst, C. Killian, Maternal and Dual-Earner Employment: Family Environment, Adaptations, and the Developmental Impingement Perspective. M.E. Lamb, Nonparental Child Care. G. Russell, Primary Caregiving Fathers. S. McLanahan, J. Teitler, The Consequences of Father Absence. R.A. Thompson, D.J. Laible, Noncustodial Parents. M.E. Lamb, K.J. Sternberg, R.A. Thompson, The Effects of Divorce and Custody Arrangements on Children's Behavior, Development, and Adjustment. E.M. Hetherington, M.M. Stanley-Hagan, Stepfamilies. H.D. Grotevant, J.K. Kohler, Adoptive Families. C.J. Patterson, R.W. Chan, Families Headed by Lesbian and Gay Parents. V.L. Gadsden, Black Families in Intergenerational and Cultural Perspective. B. Leyendecker, M.E. Lamb, Latino Families. P.C. Rosenblatt, Multiracial Families. J. Brooks-Gunn, P.R. Britto, C. Brady, Struggling to Make Ends Meet: Poverty and Child Development. K.J. Sternberg, M.E. Lamb, Violent Families. H. Dubowitz, The Families of Neglected Children.